Humanizing the candidate experience is important because it helps you attract, engage and acquire the best talent. A great candidate experience encourages talent to spend their time, which is their most valuable resource, making the company successful. Charlotte Jones is a talent attraction and engagement leader with expertise in developing and executing human resources and communication strategies that translate into progressive business results. Charlotte leads Lockheed Martin’s recruitment marketing team, including the career website, digital-social-mobile media campaigns, employer value proposition, and employee referral program. She has more than 20 years of experience in marketing, HR program management, diversity management, talent acquisition and recruitment marketing in various industries including telecommunications, aerospace and defense, and financial services/insurance. Charlotte has held senior HR manager positions for diversity recruiting programs at MetLife and Merrill Lynch. She served as Employer Branding Manager for Verizon and AT&T where she led a global employer branding campaign. Charlotte holds an MBA in Business Management, Senior Professional Human Resources certification and is Board Member of Socialmedia.org. 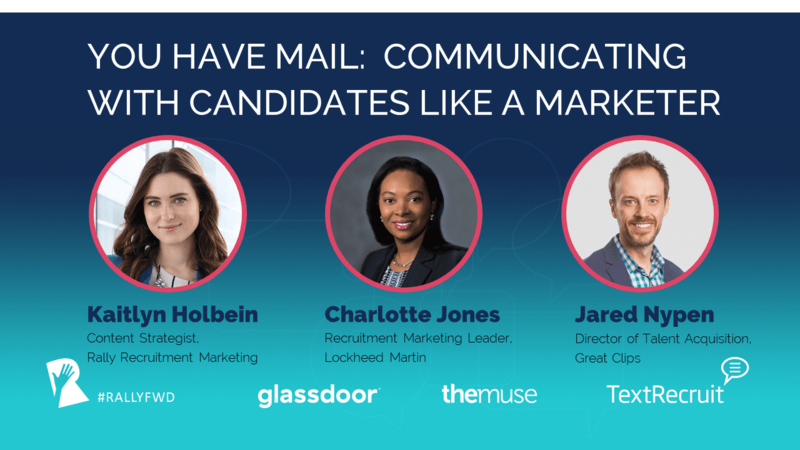 Humanizing the candidate experience is important because people want to feel a genuine connection with their employer and future colleagues. Jared Nypen is the Director of Talent Acquisition for Great Clips, the largest haircare brand in North America. He leads the system-wide recruitment strategy including employer branding and recruitment marketing technology. As part of a wholly franchised organization, his team helps salon owners build and deliver recruiting strategies to attract top stylists within their markets. Jared routinely speaks at Great Clips conferences to motivate and educate franchisees on building the best salon teams in the industry. Prior to Great Clips, Jared led the recruitment and performance technology strategy for Best Buy Corporation. He also spent 12 years at Target Corporation where he led college recruiting teams, built recruitment strategy and led the technology implementations for talent acquisition and performance management. Jared is a Rally Recruitment Marketing Mentor, where he provides guidance and advice to practitioners seeking to develop their recruitment marketing skills. He is certified as a Senior Professional in Human Resources (SPHR) and as a Society for Human Resource Management Senior Certified Professional (SHRM-SCP). He lives in the Minneapolis area with his wife, Andrea, and three children.